Is Edwin Encarnacion the real deal? Since arriving in Toronto in 2010, he has emerged as one of baseball's premier power threats. Yet, his cards are, on a whole, still very cheap. 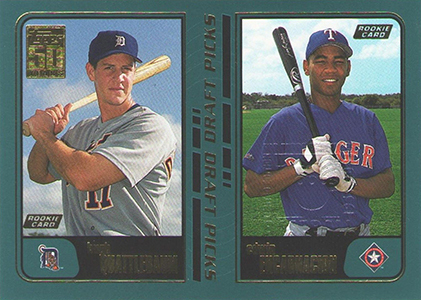 Originally drafted by Texas in 2000, Encarnacion never played for the Rangers. He was traded to Cincinnati in 2001 where he ended up playing from 2005 through 2009. Toronto traded for the slugger in a deal that sent Scott Rolen back to the National League. Although Oakland picked Encarnacion off of waivers in 2010, he became a free agent less than a month later and ended up back with the Blue Jays. 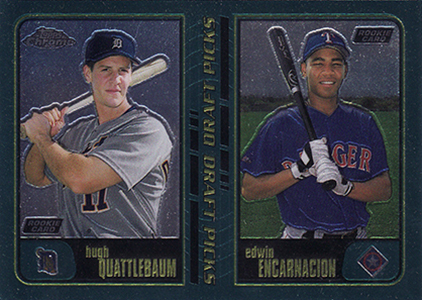 Shop for Edwin Encarnacion cards on eBay. 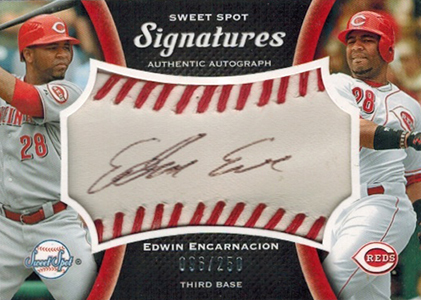 Encarnacion was solid with the Reds, including 26 home runs in 2008. But he really came into his own in 2012 when he drilled 42 homers. He followed that up with another 36 in 2013 and is continuing with an even more torrid pace in 2014. Yet, even the most high-end Edwin Encarnacion cards are very affordable. Playing in Toronto certainly doesn't help. Not only is the team often overlooked (outside of Canada), but he plays with some other big stars like Jose Bautista and R.A. Dickey who get more of the spotlight. Age should also be taken into account. It has taken a long time for Encarnacion to breakthrough. The drawback with that is that he likely won't have more than a handful of years left. This will make it tough for him to put together big career numbers. Even with these factors, Edwin Encarnacion cards are softer than they deserve to be. Even if you don't go big on a player collection, he's a prime player to go out and pick up a couple of key cards. Here's a list of ten key cards to look for. Ultra-limited cards weren't included due to their rarity, although high-end sets like 2014 Topps Museum Collection have some nice patch pieces. Click on the links or images to shop for singles on eBay. 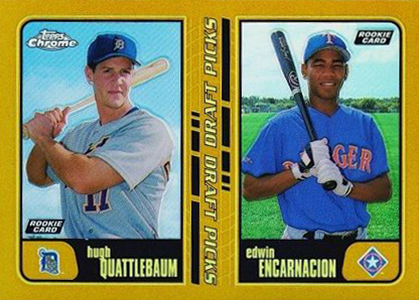 Collectors have just two Edwin Encarnacion rookie cards to hunt for and he shares both with Hugh Quattlebaum who has a fun name but never made the majors. This Topps card is cheap enough that collectors may want to opt for the Gold parallel that's numbered to 2001. Carrying a bit of a premium over the base Topps version, this may be the rookie card of choice for a lot of collectors. But that's not saying a lot. 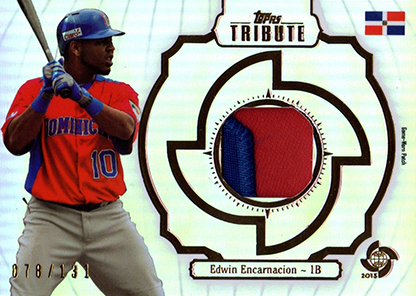 The gold-bordered Retrofractor is growing in popularity as Encarnacion starts to build a bit of a hobby presence. With Topps celebrating its 50th anniversary in baseball in 2001, the company produced a limited number of sets for its employees. 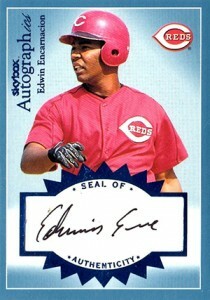 These cards have a faint embossed stamp over Encarnacion's image. 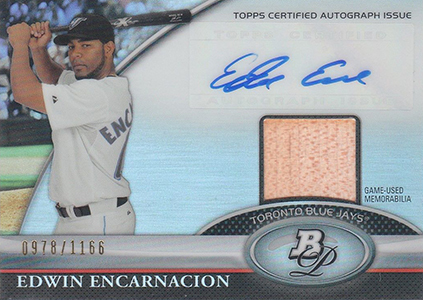 Due to their rarity, this is one of the most valuable Edwin Encarnacion cards. When it comes to autograph cards, the Autographics name is a classic. However, it was largely ignored once it became its own brand. It is the first set, though to have Edwin Encarnacion autographs. Numbered to 188, his basic Signatures Blue card is solid but not spectacular. Being paired with Barry Larkin certainly elevates this card's status. Both a Hall of Famer and not a regular signature on cards, Larkin autographs command something of a premium in their own right. Limited to 50 copies, supply has long since dried up making this card tough to find on the secondary market. 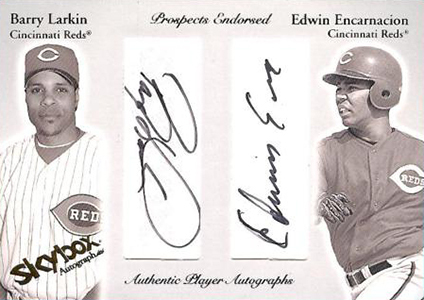 Upper Deck included Edwin Encarnacion autographs in several of their 2008 products. The Goudey and Masterpieces cards looks solid with their on-card signatures. However, Sweet Spot has the iconic ball leather design, which makes it the best of the bunch. 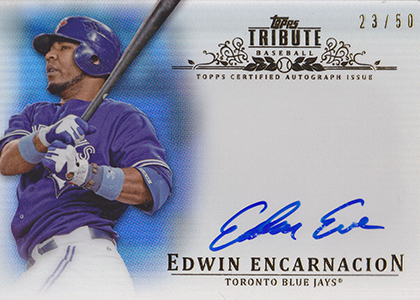 This is the first set to offer an Edwin Encarnacion autograph in a Toronto uniform. Numbered to 1166, it's not tough to find. But that also helps keep the price down. The signature uses a sticker. The card also has a piece of game-used bat. 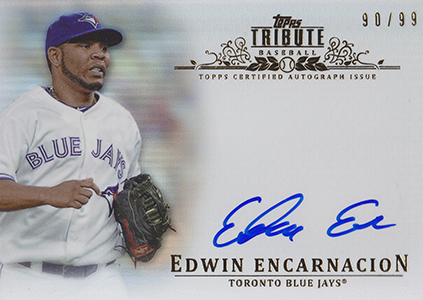 2013 Topps Tribute Baseball has a pair of base Edwin Encarnacion autographs. Both are highlighted by on-card autographs and a strong design. Better yet, the Blue parallels (#/50) look even better with colored backdrop that matches the Blue Jays uniform. Granted, World Baseball Classic cards aren't the hottest things in the hobby. However, they're are something a little different and there won't be lots of them. The patch cards in 2013 Topps Tribute WBC look great and they're cheap. 2014 Topps Museum Collection Primary Pieces has a base version numbered to 99. However, the Copper parallels aren't much harder to find. The swatches are also much more interesting. 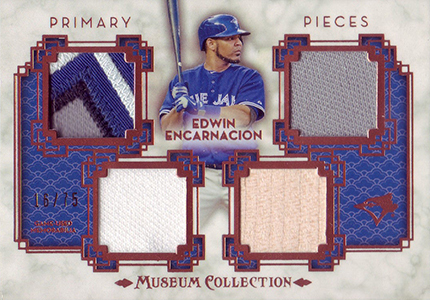 Usually, the base Encarnacion versions have four plain swatches that all look the same. Copper adds some variety with different colored swatches, a patch and a bat piece. The price tag for the parallel is also very reasonable. Steve � So is everyone supposed to ignore players who are emerging stars or might be overlooked? Also, I don’t recall telling people to buy things. I’m a huge believer in collecting for enjoyment. For every collector, that means something different. If people like Encarnacion, they’ll probably want to buy his cards. If some collectors want to buy some Encarnacion cards to flip them, there might be an opportunity to do that too. However, there’s also a paragraph in the article pointing out how he probably won’t have prolonged career success due to his age. With many great cards trading for less that $10, are they worth a look? Absolutely when you compare that to a couple of packs of cards. Do you HAVE to go out and buy them? Not at all. Also, I haven’t sold a card myself in probably 2 or 3 years and I have no knowledge of what others might or might not be selling. Please don’t get me wrong, I’m not trying to accuse you of anything here. I’m just pointing out that these types of articles can sometimes serve to persuade collectors on what they should buy, which is something I don’t believe any respected hobby expert should do. I liken it to insider trading on the stock market. For someone like me who relies on flipping cards to help fund my interest in the hobby, I look for players who are on the verge of emerging as stars so that I can buy their cards for cheap and sell them once everyone has jumped on the bandwagon. (Had great success with Jeremy Lin during his run in NY.) I’m not suggesting that collectors overlook these types of players, I’m just saying that articles like this can sometimes take away my competitive advantage when it comes to capitalizes on players in this situation. It would be no different if PSA or JSA came forward and said, “Hey everybody, Bill Russell is getting super old and doesn’t sign autographs very often, now would be a good time to start collecting his memorabilia.” Then one of their authenticators lists his entire Bill Russell collection when the market prices start shooting up. It’s the power of information. I just don’t want to see the Cardboard Connection fall into a scenario like this because I view you guys as a third-party informational resource for a lot of the things I research and buy. Steve � As I’ve said, I will personally never tell someone what to buy or not to buy. That’s always up to an individual collector based on what they enjoy and their collecting goals. That being said, of course we are going to give a player their due when they’re playing well and people might be overlooking them. Not doing so would be a disservice. But at the end of the day, collectors should be buying what they want at a price they’re comfortable with. And you are correct, there is power in information. People who are better informed make better decisions. That’s why we strive to provide as much of it as possible, whether that’s set information, checklists, market trends, etc. My hope is that with that information, collectors will build collections they’re happy with and can enjoy.